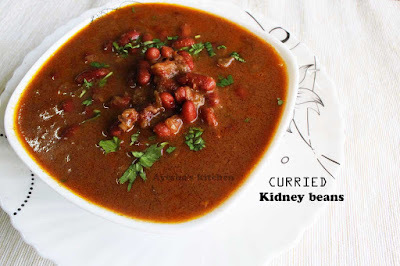 Today let's see how to make a simple curry with red kidney beans. Beans are a great source of fiber and proteins which help to reduce cholesterol. This impressive and perfect curry recipe is made in minutes. Such hearty curry ideas pair best for breakfast side dishes. Yes, this is one of the easy ways to enjoy kidney beans. Let's see some of the amazing benefits if eating red kidney beans. 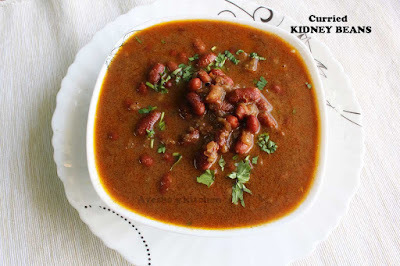 This is the one reason which I hooked to kidney beans. That is, consumption of red kidney beans helps in weight loss. It helps to treat and prevent certain cancers. Kidney beans can prevent and treat diabetics. It helps to reduce heart-related problems. The only precaution regarding red kidney beans is that it must be cooked before eating. As raw kidney beans contain a toxin which can cause liver damage, it is always best to soak kidney beans for few hours and discard its soaking water, then wash and cook until done. Soak the red kidney beans in water for 4 hours or overnight. When done, wash it and drain the excess water, set aside. Grind together all the ingredients given under ' to make paste ' until smooth. Set aside. Heat oil in a pressure cooker. Add sliced onion and saute until it turns translucent. To this add the soaked kidney beans along with chopped tomato. Mix well. Add half a cup of water and pressure it for 2 or 3 whistles or until beans are done. When the pressure releases, open the lid and combine well. Again cook for sometimes with the lid open. Make a thick consistency gravy. Add hot water if you require thin curry consistency. Check for salt. Add chopped coriander leaves and remove from flame. Seasoning of curries gives an excellent aroma to any curry recipes. So heat a pan with oil, splutter mustard seeds and add curry leaves. Pour over the curry. This is optional. Serve hot along with chapati, dosa, fried pathiri, paratha etc.